Caracas (AFP) - Thousands of opposition protesters, led by Venezuela's self-proclaimed acting president Juan Guaido, on Wednesday called on the armed forces to abandon President Nicolas Maduro and allow humanitarian aid into the crisis-wracked country. People took to the streets in the capital Caracas and various other cities, banging pots, blowing whistles and horns, and carrying banners that read: "Armed forces, regain your dignity," "Maduro usurper," "Guaido, president" and "No to the dictatorship." He also wrote in a New York Times op-ed published Wednesday that the support of the military was key to efforts to oust Maduro, saying secret meetings had been held with members of the security forces. "The military's withdrawal of support from Mr Maduro is crucial to enabling a change in government, and the majority of those in service agree that the country's recent travails are untenable," Guaido wrote. Guaido quickly earned the support of the United States and several Latin American countries. Six major European nations have told Maduro to call those elections by the weekend or they too will recognize Guaido. "Large protests all across Venezuela today against Maduro. The fight for freedom has begun!" US President Donald Trump tweeted after speaking with Guaido. The political upheaval has exacerbated the general disarray in Venezuela, which has the world's largest proven oil reserves but has suffered an economic meltdown marked by hyperinflation and shortages of basic necessities. 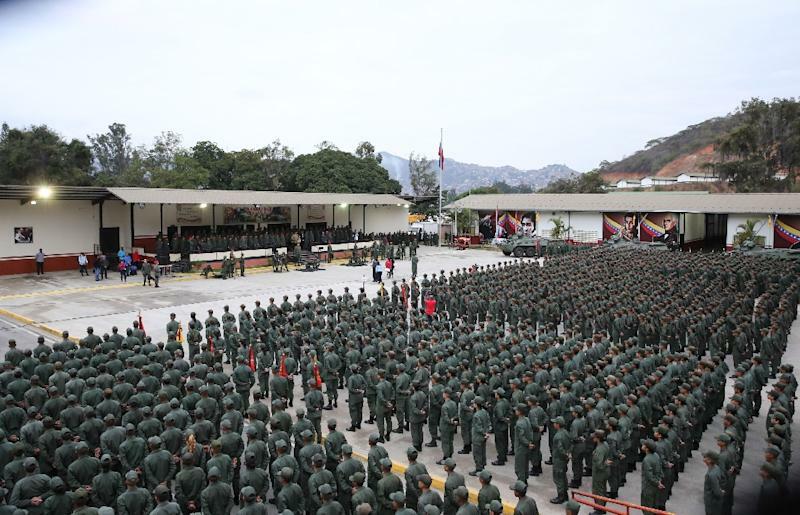 Earlier, Maduro had tried to rally the armed forces himself, meeting with 2,500 soldiers in the capital and calling for "unity" while hitting out at military "mercenaries." He accused the "oligarchy" in neighboring Colombia of being behind an attempt by military deserters to drive a wedge between him and the armed forces -- which are key to his hold on power. He has also cracked down on the foreign media working in Venezuela. Two French reporters and a Colombian photographer have been detained and two Chilean journalists were deported Wednesday. "Do you want a puppet of the gringos to govern Venezuela?" 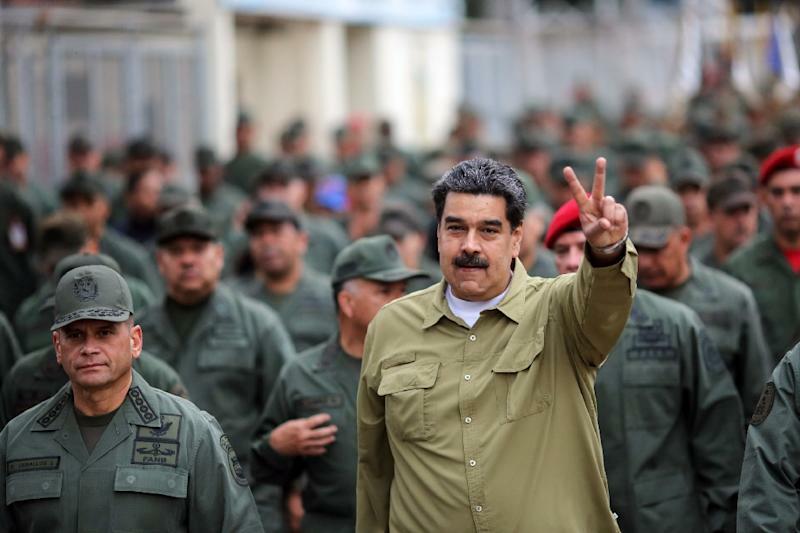 Maduro asked the soldiers, referring to Guaido. They responded with a resounding: No!" Earlier this week, the United States imposed oil sanctions on Maduro's regime in an attempt to starve the government of its funding. US National Security Advisor John Bolton warned American businesses not to "deal in gold, oil, or other Venezuelan commodities being stolen from the Venezuelan people by the Maduro mafia." 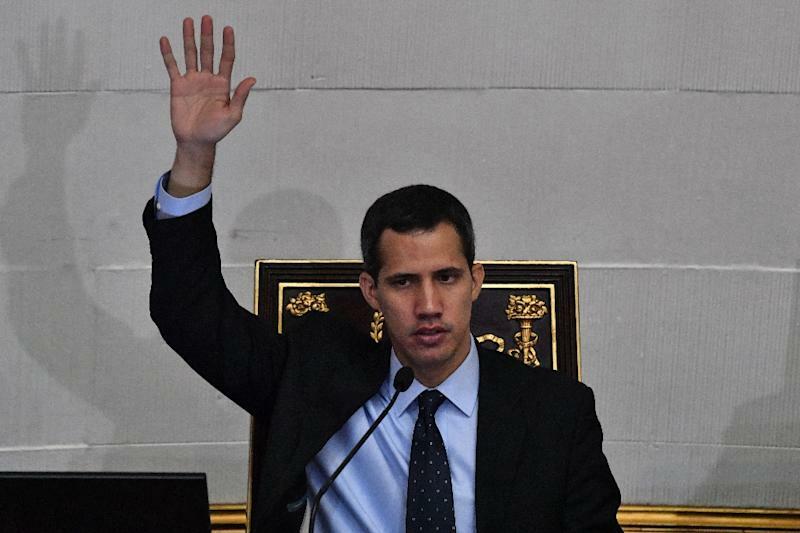 In an interview with the German daily Bild, Guaido called on EU countries to impose additional sanctions on Maduro's government. The punitive measures could deprive Maduro's regime of 80 percent of its liquidity, analysts said, leaving many citizens worried about how they will cope. "We're working to bring in humanitarian aid as soon as possible," said Guaido. In an interview with Russia's RIA Novosti agency, Maduro said he was willing to negotiate with the opposition and even offered to bring forward legislative elections -- though dismissed the idea of a new presidential poll. "If imperialists want new elections, let them wait until 2025," he said. The European Union, US and many Latin American countries joined the opposition in dismissing the legitimacy of the election Maduro won in May. Although in opposition hands since 2015, the National Assembly has been sidelined since 2016 as the Supreme Court -- dominated by regime loyalists -- annuls its every decision. The US has urged Venezuela's armed forces to "accept the peaceful, democratic and constitutional transfer of power," and has refused to rule out military intervention. Mexico and Uruguay announced they would convene an international conference for "neutral" countries to discuss the crisis in Montevideo on February 7, in response to a call from UN chief Antonio Guterres to "initiate dialogue."